We were a little envious when friends in the publishing world recently quoted Men’s Health magazine’s spectacular circulation figures to us. And when we picked up a copy, we were impressed by its look and feel. But it wasn’t until we read a few of the features that we really started feeling bad—not because Contexts didn’t stack up, but because we’d uncovered a whole raft of troubling personal inadequacies we didn’t even realize we had. Where to start? Well, our metabolisms aren’t “fired-up,” we’re not doing the high-intensity squats that would give us “quads of the gods,” and there are apparently dozens of “sizzling bedroom tips” that our partners wish we knew. Imagine that! (Or, maybe not.) Even worse, judging by the Ultimate Ab Workout centerfold poster, neither of us is on the Six-Pack Fast-Track. The editorial strategy Men’s Health follows is no doubt familiar to readers of women’s magazines. By setting an unattainable ideal that plays on readers’ insecurities, a publication can offer a steady stream of quick-fix articles and products to keep them coming back for more. Consumption culture at its finest—and most troubling (for more on this, you might flip to Sarah Knudson’s review of the film Eat Pray Love or Amanda Gengler’s article on teen magazines). While social scientists are perhaps more wary of quick-fixes, we are in the business of connecting putatively personal troubles to larger social forces—especially those that result from the sharp clash of ideals with stubborn reality. In this issue, Contexts dives headlong into real and ideal visions of the social world. Erik Olin Wright, president-elect of the American Sociological Association, has some strong ideas about closing this gap; our cover story is drawn from his “real utopias” project. In another feature, members of our student editorial board tell the real stories of “embedded sociologists” working on the ground in diverse institutional settings, far from the ivory tower. Mark Rank and Joe Soss contribute powerful statements on the ugly reality of American poverty in this issue, while Richard Alba uses the Sacco and Vanzetti case to gain perspective on historical and contemporary perceptions of immigrants. And when Contexts takes up the subject of weight gain, we do so with an eye to social analysis rather than personal improvement, as in Mary Nell Trautner and Samantha Kwan’s article on size discrimination. 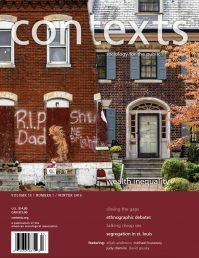 So, in contrast to some popular magazines, you won’t discover “Six Reasons to Feel Badly about Yourself” in this issue of Contexts (much less three things you can buy to make yourself feel better). Instead, our mission is to bring you stories of engagement between social science and the real world. And, unlike our abs, that mission is rather well-defined—if we do say so ourselves.